Yesterday, I finished my first quilt of 2015. Introducing Green Peek. 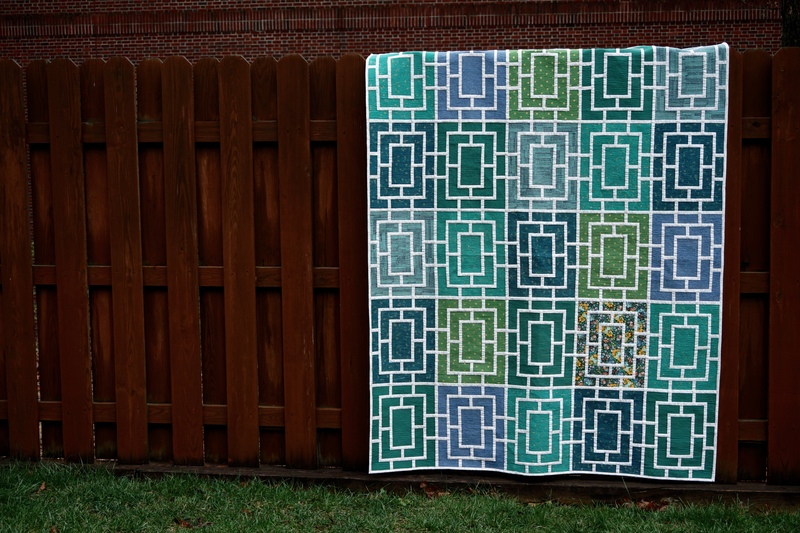 I love every piece of fabric in this quilt– shades of jade, emerald, teal, and blue from collections by Carolyn Friedlander, Cotton + Steel, and Kona Cotton. 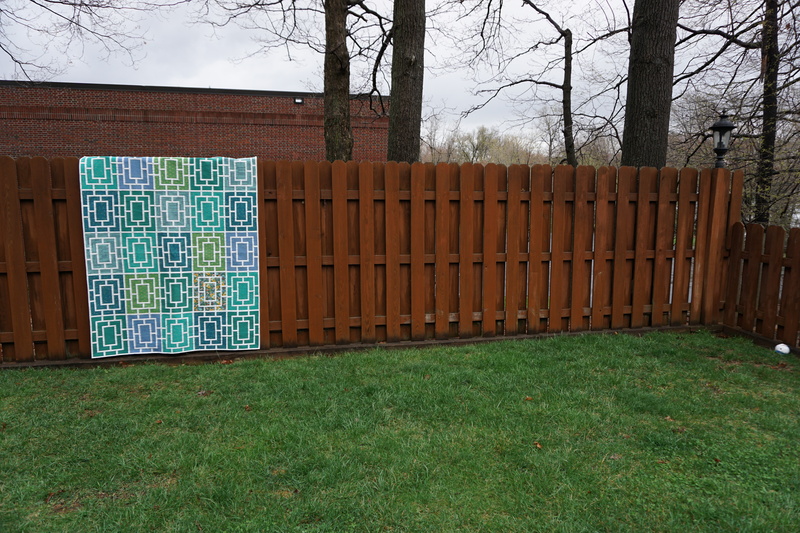 All of the single-color blocks coordinate with the focal block, which I also call the rebel. It’s Anna Maria Horner from Honor Roll. The sashing and binding is from Carolyn Friedlander’s Botanics, Grid in Charcoal. 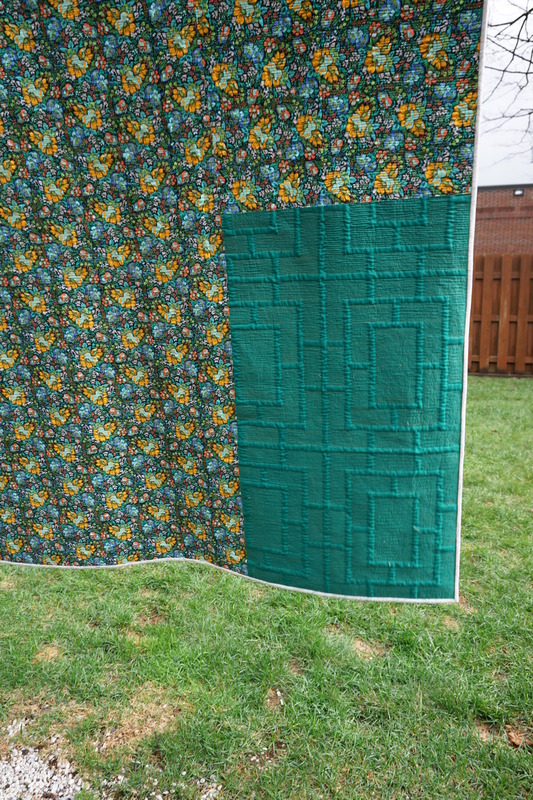 The quilting is dense organic waves in Aurifil Light Brass. The white skinny piecing is unquilted, and in person the texture really supports the design. This process, including burying the thousands of threads it created, was tedious but so worth it. Huge thanks to my Instagram family who cheered me on and helped me celebrate every tiny milestone to keep me motivated. This is the first of my quilts for which I’ll have a pattern to sell, and I’ll be sure to post all the details about its sale here in the next week or so. It look so cool on the back! 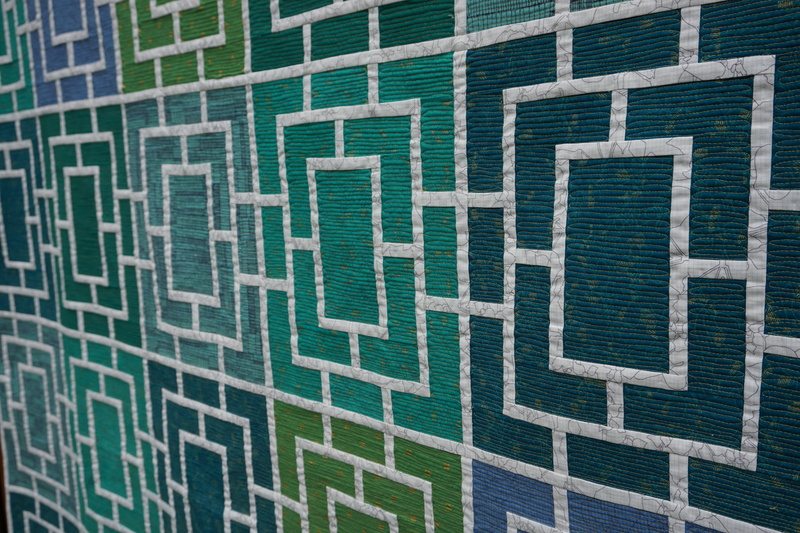 Such a neat design, and the quilting really gives it such a neat texture and 3D effect! Wish I could run my hands over it! I agree with Renee – I love how the quilting really pops out on the solid fabric on the back. 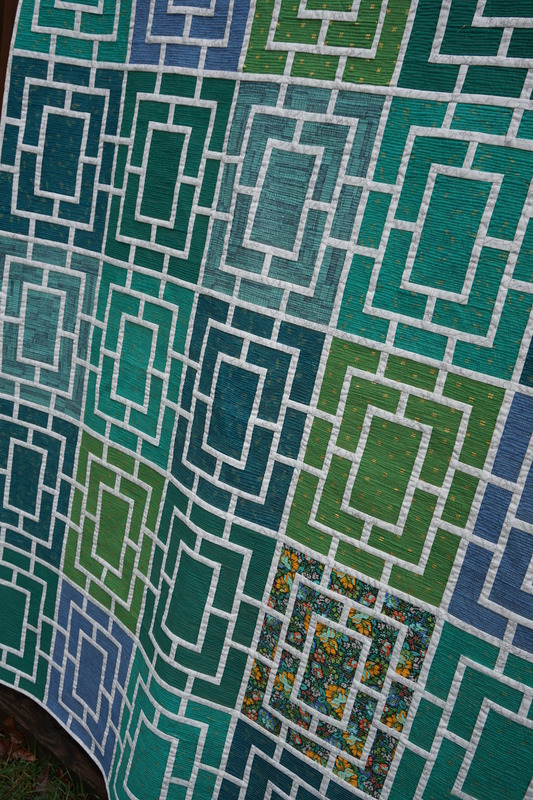 I am so glad you stuck with the quilting; it is a beautiful finish! So gorgeous. Just so very gorgeous. Very beautiful, Melanie!! Great quilting, perfect finish! This is my second favourite of your quilts (the first being Bricks). I love the formal arrangement and your green colour choices. Just lovely! I love the Rebel! All of your details – design, fabric choices, quilting – are amazing! Holy Amazing Melanie! This quilt (and being along for the process of making it) is amazing. I love it so, so much! Bravo lady!